Miraculously, I started this early!! Well before the deadline, even. I don’t know what has come over me! It’s summertime. And that means barbecuing. And hamburgers. And sitting outside to dine. And not bothering with forks because fingers work so well. T really loves it when summer rolls around because at last we can have hamburgers for dinner. I know. Other people have hamburgers all year round. But for me, it HAS to be hot outside and the days should be long and sunny with evenings full of the sounds of children playing in their yards and cicadas buzzing electrically in the tree tops. Sure, the cicadas are just barely starting to buzz. But the rest of the criteria have been fulfilled. How very clever of Sara (I Like to Cook) to choose hamburgers as this month’s BBBabe task. I couldn’t wait to start rolling out hamburgers!! But before actually starting, I bothered the other BBBabes with my questions. I was all worried about the kosher salt that WS called for and exactly how much salt that was. Because, as usual in North America, recipes measurements are in spoons and cups rather than by weight. (I know; I was ranting about salt measurements not long ago….) The kosher salt called for is probably the brand of kosher salt most commonly available (Diamond Crystal). At least I think that’s what’s most commonly available. That’s the only kind we can get at our supermarkets. And as everyone knows, Toronto is the center of the universe. The other BBBabes wisely advised that it’s probably easier to just add some salt…. I decided that for once in my life, I’d start something well ahead of the deadline. And to reward myself for being so well prepared, I gave myself permission to play fast and loose with the recipe. Oh wait!! What’s this?? It looks like Sara already did that! Have fun with this recipe. Do what you like – change the flour, shape, toppings….anything goes! The recipe calls for unsalted butter. Normally, I use unsalted butter for baking. And we have unsalted butter. But we also have salted butter that costs considerably less than unsalted. Having just done our taxes, I’m feeling somewhat parsimonious (not that the difference in price is THAT much…) so decided to use salted butter. I cut the butter up and put it into the bowl. And weighed half the amount of just-boiled water to melt the butter. When it was melted, I added the rest of the water (room temperature) to bring the temperature down to baby-bottle temperature. I whisked in the requisite amount of powdered skim milk. Then I started measuring the yeast… What?!! Four and a half teaspoons of yeast?! For four cups of flour??? Are they crazy in the Williams Sonoma kitchen? I made an executive decision and whisked in just one teaspoon of yeast. And it was time to weigh the flour. Of course, I had to add just a little whole wheat flour. All white flour is just too dull and would make buns that taste like cake. And speaking of cake, is W-S serious? FIVE tablespoons of sugar? I don’t think so. I added one tablespoon. My scale said that it was 8 grams. No… 9 grams. No… 7 grams. No… 10 grams. I poured some kosher salt into my hand and into the bowl on the scale. Which registered 4 grams. I poured some more salt into my hand and added another 4 grams. That’s 8 grams. I had calculated that a tablespoon of kosher salt is probably 12 grams. But I used salted butter. So I should use less salt. I was just about to add a tiny bit more salt to bring the measure up to 10 grams and suddenly the scale said that it was already 10 grams. Eeeeeeeeek!!! Is there something awry with my scale? Oh oh oh oh. Oh . . . . Oh . . . .
Fiddle dee dee. I’ll just pretend that I didn’t notice. I kneaded the slightly slack dough and put it into the bowl to rise. Fingers crossed that everything will work out okay. Thank goodness. The dough is starting to rise. Yay!!! Time to assemble hamburgers! The buns look beautiful! Thank goodness, the buns were indeed fabulous. The bread took forever to be done and well… let’s just say that it’s not a good idea to make this particular dough into bread…. Naturally, now you’ll want to make Hamburger Buns too. But unless you like really sweet bread, you too will probably want to cut back on the amount of sugar. Oh, and you will probably also want to make more that 3 giant buns. Please do divide the dough evenly into 12 pieces. Or if you really want large hamburgers, divide it into 8. Mixing: In the morning of the day for serving hamburgers: Heat milk in a pot until it is just about to boil. Cut the butter into a large mixing bowl and pour the hot milk overtop, stirring until the butter melts. Set this aside to cool to baby bottle temperature. When the milk/butter is lukewarm, add the yeast. Whisk together until the yeast dissolves. Add the dry ingredients (except the sesame seeds) to the liquid and using a wooden spoon, stir until the dough pulls away from the bowl and the flour is pretty much encorporated. Cover and set aside to sit on the counter for about 20 minutes. After 20 minutes has passed, scatter a light dusting of flour on your board for kneading the dough. Turn the dough out onto the board. Wash and dry your mixing bowl. This prepares the rising bowl AND gets your hands clean. Knead the dough for about 10 minutes . As you knead, add as little flour as you dare to stop the dough from sticking. Keep scraping any dough that is on the board so the board is always clear. Knead until the dough is smooth and silky. Put the dough in the clean mixing bowl. Cover and allow to rise in a no-draft area til it has doubled. When the dough has doubled, you can either gently push it down and allow it to rise again, or you can shape the dough. A good way to tell if the dough has doubled is to wet your finger and poke a hole in the top of the dough. If the hole fills up, it hasn’t risen enough. If there is a whoosh of air and the dough deflates a little, it has risen too much. If the hole stays in exactly the same configuration and the dough remains otherwise intact, it is ju-u-st right. Shaping: To shape the buns, turn the dough out onto the lightly floured board. Divide the dough into 12 even pieces (don’t make the mistake I did!! Giant hamburger buns might be delicious but they’re ridiculously filling.) Shape each bun into a tight round. To do so, fold each piece like a business letter. Then gently grabbing the side of one of the ends, make a false braid. Fold the top half over to the middle and gently make another false braid. The dough will want to roll in on itself. This is a good thing. Once it shapes itself into a quasi ball, put it seam-side down on the board and gently turn it round and round to smooth out any rough edges. Place the finished rounds, well apart, on two parchment covered cookie sheets. Pour some sesame seeds into a saucer. Pick up one of the shaped rounds and using a pastry brush, gently brush the top with water. Turn the round over and gently plop it down into the sesame seeds. Place the round back on the parchment paper, sesame seed side up. Repeat with the other rolls. Once the rounds are all covered in sesame seeds, gently press them down with the flat of your hand to form discs. (Make sure none of the discs are touching each other.) Cover the cookie sheets with a clean tea towel, followed by a large plastic bag and let rise again on the counter (out of drafts) until the buns have almost doubled (about an hour depending on how warm your kitchen is). To test, flour your finger and press gently on the edge – it should very slowly spring back. For comparison, try pressing early on to see how it quickly springs back when the dough has not risen enough. 1.) Milk: I used 375gm (~1½ c) water and 45gm (~⅔ c) powdered skim milk. N.B. Under no circumstances do I ever use water from the hot water tap. Water from the hot water tap sits festering in the hot water tank, leaching copper, lead, zinc, solder, etc. etc from the tank walls… the higher temperature causes faster corrosion. Of course, saying that it is unsafe to use water from the hot water tap might be an urban myth, but why tempt fate? I heat the water in our kettle. 2.) Yeast: Williams-Sonoma calls for 14 gm (4½ tsp) active dry yeast. That seemed like WAY too much yeast to me. I decided to quarter the amount. 3.) Butter: Williams-Sonoma calls for unsalted butter. We had salted in the fridge so that’s what I used…. Next time, I’ll cut the butter drastically as well. I’m thinking that a couple of tablespoons would be plenty. 4.) Flours and Wheat Bran: The BBB recipe calls for all purpose flour only. I am incapable of making bread with just white flour. The whole wheat flour (atta) we have right now is very finely milled so I like to add a little actual wheat bran as well. 5.) Sugar: Williams Sonoma calls for a whopping 5 Tablespoons of sugar. Perhaps they have multiple shares in a sugar beet farm or sugar factory…. This huge amount of sugar may explain the large amount of yeast suggested. 6.) Salt: The recipe calls for 1 Tablespoon (12 gm???) kosher salt. (Or is it 9.5gm??? ***) I used a little less than 12 gm salt because of using salted butter. 8.) Baking: If you wish to serve warm buns, reheat them after they have cooled completely. To reheat uncut buns, put them on the top shelf of the hot barbecue for a few minutes. OR… turn the oven to 500F for 5 minutes or so. Turn the oven OFF. Put the buns in the hot oven for ten minutes. Alternatively, cut or break the buns in half and place them crumb side down on the barbecue to toast slightly. I prefer to break open the buns rather than cut them. They taste better that way. I picked up this recipe card from Williams Sonoma last year in Calgary. Summer will soon be here and who doesn’t like to bbq a burger or hot dog in the summer? And you just know that it will taste even better on a bun you’ve made yourself. 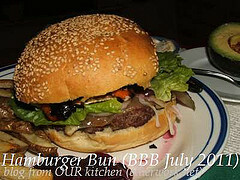 The recipe gives directions to make regular sized burger buns as well as slider sized buns. […] Have fun with this recipe. Do what you like – change the flour, shape, toppings….anything goes! How does one make a slider?? And WHAT is a slider??? A slider is a cute little mini burger. Ooooh!!! Just the thing for two hogs like us…. Of course, you’ll want to bake along and receive a Baking Buddy Badge to display on your site; bake Hamburger buns and post about them (we love to see how they turned out AND hear what you think about the buns) before the 29 July 2011. If you don’t have a blog, no problem; we still want to see and hear about your bread!! Using a ruler as a guide, cut the dough into 2 1/2 inch (6cm) squares. I WONDERED why they were all making square buns!! Line a baking sheet with parchment paper. On a lightly floured work surface, roll out the dough into a 10 by 7 1/2 inch (25 by 19 cm) rectangle. Using a ruler as a guide, cut the dough into 2 1/2 inch (6cm) squares. Transfer to the prepared baking sheet, spacing the buns evenly apart, and cover tightly with plastic wrap. Let rise in a warm place for 30 minutes. Makes 12 hamburger buns. For slider buns: Follow the instructions above but roll out the dough into a 9 inch (23 cm) square. Cut into 1 1/2 inch (4cm) squares and place on 2 parchment lined baking sheets. Cover tightly with plastic wrap and let rise in a warm place for 30 minutes. Position one rack in the upper third of an over and one rack in the lower third and preheat to 400’F (200’C). Brush the tops with the egg mixture and sprinkle with sesame seeds if using. Bake for about 14 minutes, rotating the baking sheets from top to bottom and 180 degrees halfway through baking. Makes 36 slider buns. Thank you, once again, Sara! We loved our hamburgers! Natashya, Living In The Kitchen With Puppies: Bread Baking Babes have Cute Buns! Susan, Wild Yeast: The Babes Have Buns! How handy is that to know?! This entry was posted in baking, BBBabes, bread - yeasted & unyeasted, bread recipe, food & drink, posts with recipes, PPN; YeastSpotting, MLLA, Bookmarks; T&C on Saturday, 16 July 2011 by ejm. They really were as close to store-bought classic burger buns as I have made too – except so much more fresh and delicious of course! The burgers look great! I am really wanting a burger for breakfast this morning..
Super sized buns Elizabeth! I love your posts and the highs and lows of the experience..and this one was a winner wasn’t it? What a very fun write up Elizabeth!! Close to store bought … I thought they were worlds better. Sounds like some of my caviler attitude has rubbed off on you. But you are exactly right that was way too much sugar. However for this one I used almost the 4 teaspoons yeast, a little shy but way more than you. In my warm kitchen and so many friends, the yeasties in my buns were very fast puffers. Nice write-up! I never bother with what salt to use, since kosher salt can’t be found in Sweden anyway. Unsalted butter is seldom used, so it’s often old in the stores. I simply use salted butter and a reduced amount of salt, but I usually take fine sea salt instead of plain table salt — I’d like to think it has a better taste. It’s really easy for me to overseason something when I switch from kosher to table salt. I’m much better at seasoning properly with kosher or fine sea salt, since it’s what we were trained to use. Lol, I always enjoy reading the stories leading up to your finished product. And boy does that burger look delicious! Lovely buns, that burger with everything on it looks soooo good. Hamburgers in winter?!?!? It would never even occur to me. Hamburgers need beer or rose wine – neither of which I would touch in winter either…. Of course, I neglected to say that the buns tasted WAY better than storebought, Natashya. It was just the sweetness and whitebreadness that made them seem so much like the storebought kind. Tanna, I should have remembered that you always add flax seeds! Next time, I’ll do that…. Thank you Görel! We used to use fine seasalt almost exclusively as well. But then our local supermarket stopped carrying it. (No idea why). We always have both unsalted and salted butter on hand. But the salted butter is considerably less expensive so that’s what I use in bread recipes that call for butter – after all, I’m adding salt anyway. And then I add volume measure for measure of kosher salt because the kosher salt (which has a similar “better taste” of seasalt compared to table salt) is so much coarser. Riyaad, it took me a while to understand why things seemed undersalted when we switched from fine seasalt to kosher salt. But now, I don’t think I’d use anything else either. Thank you, Lien and Astrid! Astrid, I am still thinking about baking some more too! Thank you, HB, I’m glad to hear that. I’m always a little worried at my verbosity. And yes, the burger was fabulously good. That particular one was made with ground pork. But subsequent burgers (unphotographed and scarfed up before there was any chance to document them in any way at all) were vegetarian burgers – one batch made with beans and the other batch made with beans and bulgar. Exactly, Katie!! Imagine anyone even suggesting burgers in the winter. And yet, it happens all the time. You should see the incredulous looks I get in the winter when I say that it’s way too cold outside for hamburgers.